OUP has published an essay on ‘The Radical Right in Australia’ by myself and Aurelien Mondon which you can read online or download for free here. The chapter is one of many in The Oxford Handbook of the Radical Right (edited by Jens Rydgren) which will be published in hard-copy in a few months and which is intended to provide the reader with ‘an authoritative state-of-the-art overview of the scholarship on the contemporary radical right’. Members of the Perth-based neo-Nazi groupuscule ‘Aryan Nations’ were in court last week, charged with murder: ‘Robert Wayne Edhouse, 22, Melony Jane Attwood, 36, and Corey Joshua Dymock, 21, are on trial in WA’s Supreme Court accused of murdering Ms Atwood’s partner, 42-year-old Alan Taylor, at their Girrawheen home in April 2016’ (Aryan Nations white supremacist ‘death squad’ murdered man for insurance claim, court told, Joanna Menagh, ABC, February 8, 2018). See also : Aryan Nations Perth: FIFO worker Alan Taylor allegedly killed by Nazi ‘death squad’, Tim Clarke, PerthNow, February 8, 2018 | ‘Death squad’ on trial for brutal murder of Perth man, Tegan Sapwell, 9News, February 9, 2018. 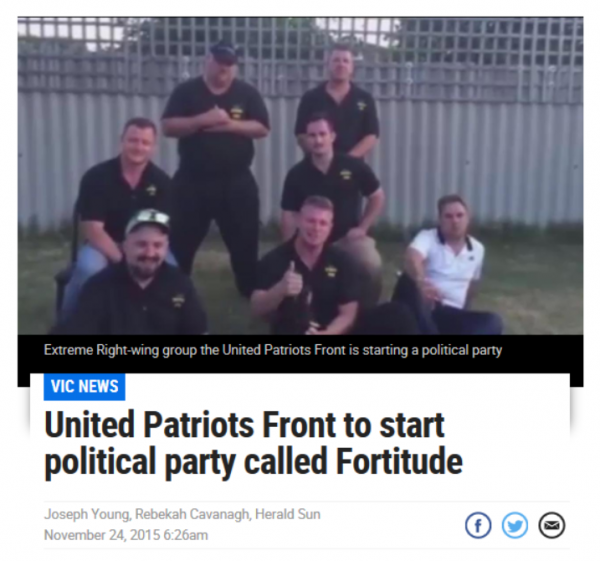 Leaving to one side the horrific nature of the alleged crime, it’s worth noting that the Aryan Nations played host to members of the United Patriots Front (now known as ‘The Lads Society’) when they visited Perth in November 2015 in order to both attend a Reclaim Australia anti-Muslim rally as well as to announce the formation of their political party, ‘Fortitude’. Indeed, the announcement by Blair Cottrell — in the company of Melbourne-based UPF members Neil Erikson, Chris Shortis, Tom Sewell and Linden Watson and Perth-based members Kevin Coombes (‘Elijah Jacobson’) and Dennis Huts — would appear to have taken place in the same property which, just a few months later, was the site of the grisly murder by their Perth neo-Nazi kameraden. Closer to home, local superhero Daniel Jones has been in the news, touting his business and the virtues of vigilantism. WHITTLESEA’s top cop has poured cold water on a crime-fighting “community response group” led by a martial-arts expert. Daniel Jones, the owner of martial-arts school Tactical Force Combatives, is in the early stages of setting up a “community response group” to deal with thugs and criminals despite police discouraging the plan. Mr Jones said he had no fear of being harmed physically while confronting offenders. He denied the group would act as vigilantes but rather said it would provide a community service where people in “distress” could contact “interested parties in the local area that would be able to rush to their assistance”. “We’re not vigilantes because we don’t want to hurt people, we just want to help people who are in danger,” Mr Jones said. Mr Jones specialises in Krav Maga, an Israeli military self-defence system, and has experience as a security guard. He said anyone “smashing in a front door” would most likely flee when his team arrived. 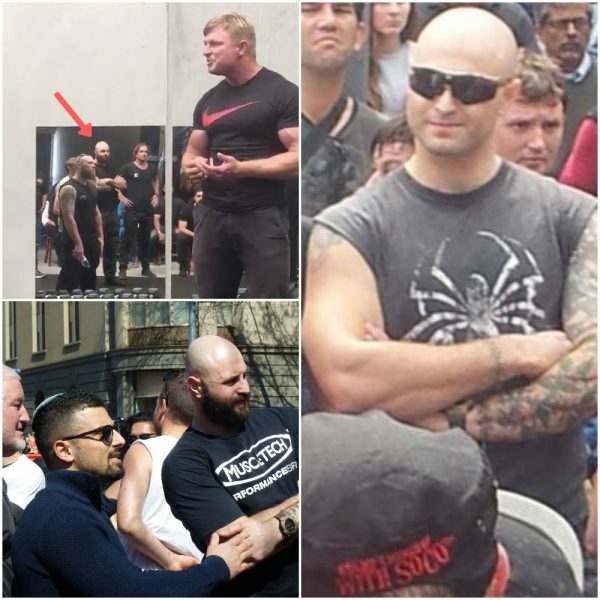 Daniel certainly gets around the traps, sticking his face in at Reclaim rallies in 2015, acting as bodyguard to Avi Yemini at his rally against crimens in September and at the MILO stoopid in December 2017 and more recently palling around and conspiring with neo-Nazi Blair Cottrell at the nü neo-Nazi clubhouse in Cheltenham (at a meeting to talk about taking on #AfricanGangs). In the United States, billionaires and their right-wing foot-soldiers on college campuses are stepping up attacks on academics and higher education. • Neo-Nazi organiser Elliott Kline (‘Eli Mosley’) was the go-to guy for JJJ’s Hack current affairs program back in August, called upon to explain to The Kids what happened in Charlottesville; he’s now been featured in an article for The New York Times (How Our Reporter Uncovered a Lie That Propelled an Alt-Right Extremist’s Rise, Emma Cott, February 5, 2018) which calls into question a number of aspects of his biography. Fingers xed, JJJ will have him back on to explain How Jews Control The Media. Oh, and in California, police have been collaborating with neo-Nazis in order to bring about prosecutions of anTEEfa (and otherwise being a nanny-state to fascists). See : California police worked with neo-Nazis to pursue ‘anti-racist’ activists, documents show, Same Levin, The Guardian, February 9, 2018. • Finally, in the birthplace of Fascism, things are once again looking promising for the movement as a recent fascist terrorist attack ‘has highlighted the growing threat of Italy’s far right in the lead-up to the March 4 elections’ (Italy’s New Racist Storm, Richard Brodie, Jacobin, February 9, 2018). This entry was posted in Anti-fascism, Broken Windows, Death, History, Media, State / Politics, That's Capitalism!, War on Terror and tagged Alan Taylor, antifa notes, Aryan Nations, Aurelien Mondon, Blair Cottrell, Chris Shortis, Corey Joshua Dymock, Daniel Jones, Dennis Huts, Elijah Jacobson, Fortitude, Kevin Coombes, Linden Watson, Melony Jane Attwood, Neil Erikson, Robert Edhouse, Robert Wayne Edhouse, Tactical Force Combatives, The Lads Society, The Oxford Handbook of the Radical Right, The Radical Right in Australia, Tom Sewell, United Patriots Front. Bookmark the permalink. Daniel Jones is not his name you moron… he is an Italian Aussie… you really are clueless. Lads Society ‘neo Nazi’ ROTFLMAO. You would not know a real Nazi if they were leading you to the gas chambers! Pull the other one fella. Daniel Jones is Daniel Jones. The Lads Society is a neo-nazi grouplet. And yeah — terrific crack about gas chambers, dickhead.